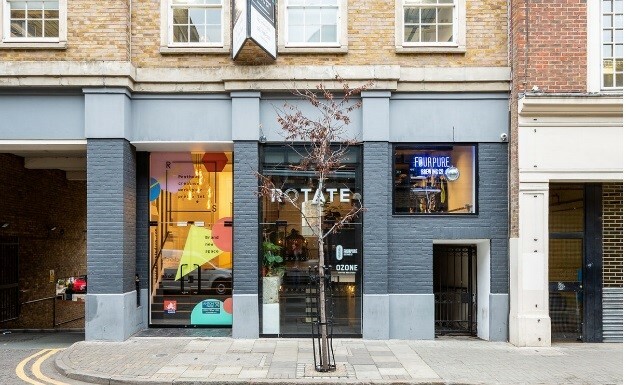 The venue hosts a ‘rotating’ residency of food and drink takeovers from London’s most exciting up and coming brands, starting with Asian-fusion street food brand Tiger Bites, who will serve food all day alongside Rotate’s own rotating drinks menu. Rotate was co-founded by friends James Stell and Robyn Llewellyn, who met during their travels in Thailand. Together, they decided to leave their corporate jobs in the City to launch a venue where they would be able to pursue their passion for food, drinks and music. Robyn is also passionate about cycling, so Rotate is aiming to be a leading cycling destination, selling the best design-led and high-performance clothing from leading independent brands from all around the world, and from its online store: www.rotatecycling.com. It also serves as a base for various East London cycling clubs and its own racing team. Housed on Shoreditch’s Rivington Street, the venue is split across two floors. The ground level features the retail side, a long bar and communal table, which is a perfect coworking space. The basement has further seating, the restaurant and where the DJ takes centre stage in the evening. Its minimalistic design has an industrial aesthetic, that includes wooden ceiling panels and polished and exposed fittings from local Shoreditch designers Buster and Punch. Rotate runs a progressive music policy on its high-fidelity sound system, with DJs playing music Thursday to Saturday evenings. Rotate also holds a diverse programme of monthly events on the other days of the week to complement its food, drink and cycling focuses; ranging from yoga, speed dating, listening parties for classic UK albums to boogie brunches. Tiger Bites will serve a range of signature bao buns, a selection of warming bowls, sides, fries and dessert. Tiger Bites prides itself that all dishes have vegan and vegetarian options too. Rotate has an extensive drinks menu, offering hot, cold, alcoholic and non-alcoholic beverages, including locally roasted artisan coffee, craft beers (including vegan options) specially crafted cocktails and wines (including specials “on rotate”). Its house blend coffee is sourced from local artisan roastery Ozone Coffee Roasters. As pioneers in London’s evolving artisan coffee scene, which sources, roasts and crafts the finest coffee, Ozone was the perfect fit for Rotate’s consumers. They also have a guest coffee “on rotate” each month, with the first from local Hackney roastery Dark Arts. Its baristas are trained by Ozone to deliver the finest coffee, whilst using state-of-the-art coffee machines to ensure consistent, quality results. The Tiger Bites menu at Rotate will be available all day on Deliveroo from February 2019 and six days a week from 5pm at Rotate. W HOTELS WORLDWIDE AND MIXCLOUD PRESENT FUTURE RISING VOLUME 3: RIGHT HERE, RIGHT NOW!